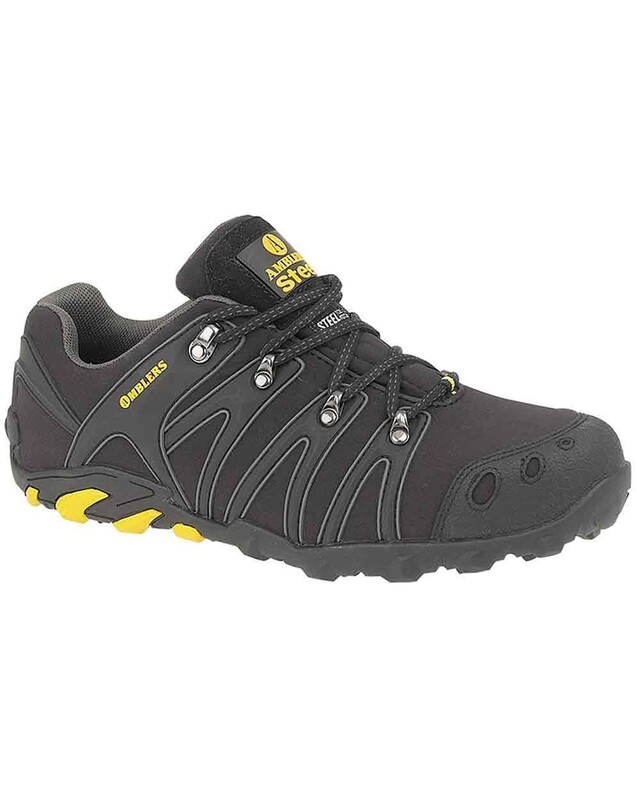 The Amblers FS23 Softshell Safety Trainer is an extra light safety trainer, constructed with a black softshell upper. Softshell is renowned for it's lightweight, windproof yet breathable properties, and this fabric has also been given a water shedding DWR finish. Particularly popular with drivers and dry trades in the construction industry, as this safety trainer also has a steel midsole. Great casual look with walking boot / trail shoe type lacing system. Suitable for men and women, the FS23 is really comfortable for all day use, with padded textile mesh lining and an energy absorbing heel. It is also very durable, with front and rear bumpers. The rubber sole unit is anti-static and slip resistant. The toecap is steel, tested to 200 joules of impact. The midsole is penetration resistant steel. The Amblers FS23 Softshell Safety Trainer conforms to EN345 S3 standard and is available in sizes 4 to 12.